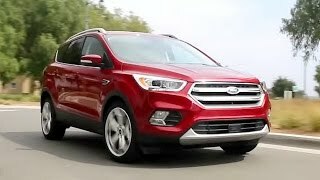 At the 2015 LA Auto Show, Ford unveiled the new generation Ford Escape 2017. The model is housed with better and efficient EcoBoost engines with some new inside and outside refined looks. Company this time didn’t confine the thoughts to any particular section and tried putting up newer and better ideas for the entire package. 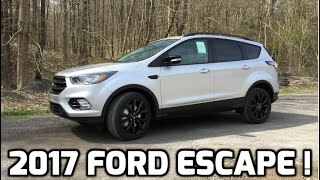 Let us have a look at the review of Ford Escape 2017 to know about it in detail. The interior of Ford Escape 2017 offers you rounds of new upgrades, making the ride more luxurious and comfortable. The first thing you’ll notice inside will be the massive touchscreen housed in center stack. The integration features SYNC 3 and is much easier to operate. The infotainment also comes with climate controls that are mounted beneath this with a USB port and 12-volt power outlet while the center console now has shifter and little storage space with two cup holders. The rear passengers get sufficient legroom. Not only this, cargo space can also be exceeded by folding the rear seats (only in case they aren’t of any use). 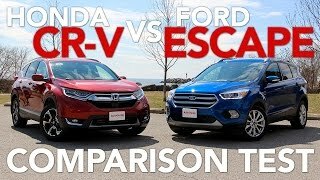 Thus rounding up the interior details of Ford Escape 2017 I would just say, company has commendably formulated space, comfort and technology. 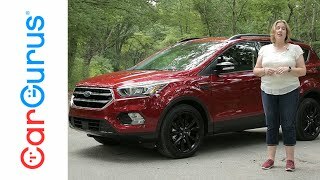 The exterior of Ford Escape 2017 follows the ‘upgrade-trend’ of interior and gets some really commendable changes. Starting with the front fascia it has newly designed grille featuring six-sides. The integration might give you clues of the looks that you might have noticed in recently released Edge and Fusion. On the either side of the grille we have HID headlights with integrated LED daytime running lights giving sharper looks to the front end. Beneath this setup we have two faux openings and a large air dam in the center amidst the fog lights. Moving towards the rear end the changes get less however the rear has new set of taillights and tailgate with sensors that just need a little effort of yours for the keyless opening. 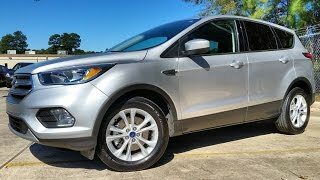 Last but not the least in the exterior details of Ford Escape 2017 I’ll be talking about the bumper which has dual exhaust tips beneath. Beneath the hood of Ford Escape 2017 will be three engine options, out of which two are totally new. The list includes 1.5 liter four-cylinder EcoBoost generating total output of 180 hp and peak torque of 250 nm while the second one is available as an option for the SE and Titanium trim. The 2.0 liter EcoBoost engine cranks total output of 245 hp and peak torque of 373 nm. The last one is a 2.5 liter i-VCT four-cylinder engine coming standard with the power output of 168 hp and torque of 230 nm. Each of these engine come paired to six-speed automatic transmission with an option to go with AWD model. The performance figures of Ford Escape 2017 are yet to be revealed and we assure you to deliver the same at your doorstep as soon as company shares it.